Watch out as the skies transform once again into a canvas-like exhibition of exhilarating fireworks in the 10th Philippine International Pyromusical Competition 2019 from February 23 to March 30, at the SM City Clark, The Meeting Place, Clark, Pampanga. The much-awaited Philippine International Pyromusical Competition is composed of 10 participating countries around the globe–including new and returning participants and Masters of Pyromusicals. 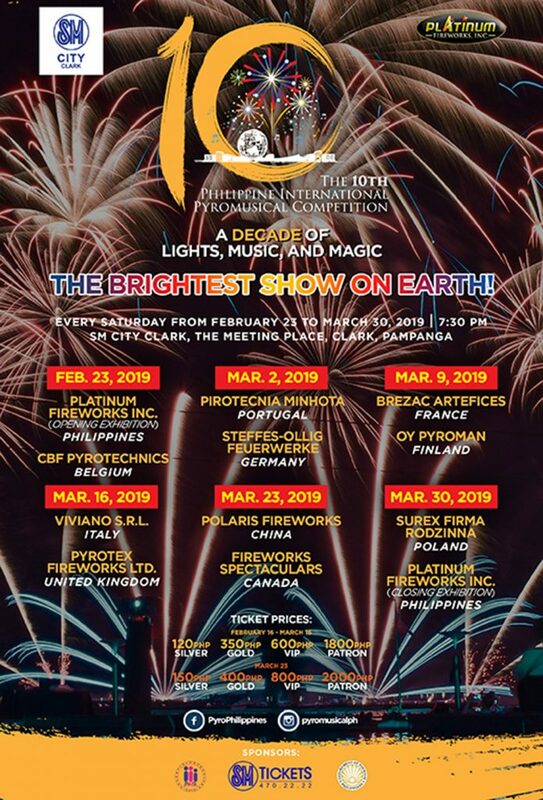 March 16, 2019: Italy’s Vivano S.R.L and United Kingdom’s Pyrotex Fireworx, Ltd.
March 30, 2019 (Closing Exhibition): Poland’s Surex Firma Rodzinna and Philippine’s Platinum Fireworks Inc.
Be sure to spread the news and don’t miss the biggest annual fireworks display in the country! For more information and ticket purchasing, you may visit smtickets.com, SM Cinemas, and at the SM Mall of Asia ticket booths starting February 14. Get updates and support the event through their Facebook and Twitter page. You may also follow, like, or check out their event photos on their Instagram page. *Ticket prices will be different on the closing day (March 30) of 10th PIPC. Where is the exacg venue for march 9 ? Mall of Asia or Sm clark pampanga ? Hi! Yes! Ticket selling started last February 12! You may purchase your tickets online here or you may buy tickets at through SM Tickets, SM Cinemas, or from official ticket sellers located at Main Drop Off(fronting Pizza Hut) and Main Mall (near National Bookstore), or ticket booths present at SM City Clark! Hi! Yes! You may surrender the ticket to the SM Cinema branch where it was purchased! How do i request for a refund of the ticket. I have tickets for Feb 16 but due to the rescheduling, it wont be possible for me to attend the event. Is there any chance i can request for the refund to be processed in SM Baguio? Hi! The ticket selling are said to be on-hold as of the moment, both online and over-the-counter. You may call them at 470-2222 for updates on when will the tickets selling proceed! Thank you! I have been trying for almost 3 hours to purchase online. There is no where on your site to actually purchase tickets. I Waby 2 platinum with dinner for the March 23 Pyromusical March 23. Please advise how I can actually purchase them. Thank you. Hi! You may purchase the tickets at the nearest SM look for the SM Tickets department. You may also direct your inquiries here 470-2222. 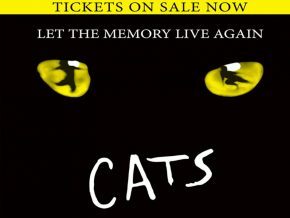 Or log-in to buy via online smtickets.com.